This is the first article I've ever written which was featured in the March edition of SNR. I was sooo nervous trying to think of an article topic when I had a bit of a mishap with a LO I was working on and the idea to write about the experience came to mind..........BTW, this is the unedited edition so it's probably not as good as the mag version...LOL! This is something all crafters have encountered at some point. We conceive what we think are brilliant ideas and then when we attempt to reproduce those ideas in reality they fall short of our expectations and worse yet, look nothing like we originally planned. This is what I was up against when I set out to work on a layout for the “white space” call. I am a self-confessed “busy layout” scrapper so it is always a challenge for me to leave white space on a layout. But I accepted the challenge and thought I had come up with a brilliant design to put it all together. 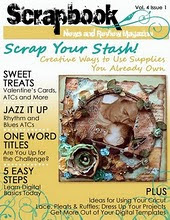 Mixed Media is a relatively new concept to me and I have had aspiration to incorporate some paste mediums directly onto my scrapbooking projects since I first discovered them. I was hoping that this was going to be my opportunity. Little did I realise just how tricky these pastes can sometimes be to work with, especially to the very inexperienced. A quarter of the way into my project things started going horribly wrong, to the point that I had just about decided to throw what I had into the bin. I took a little break from the project and came back and realised I was faced with two options. I could either chuck out what I had done or re-think my original plan and see if there was any way I could salvage my project. Because I’m an extremely stubborn person by nature it is very hard for me to accept defeat so I altered my original design and persevered. I learnt a valuable lesson from this project and I’d like to share my experience with you. To better understand this project I will give you a brief outline of the original design I had in mind. I had already selected the picture I wanted to use of my youngest son bare-chested lying on a blanket which I had printed out in black and white. I was going to crop the picture down and then add some gorgeous Dusty Attic angel wings to the picture. I then wanted to frame the picture with a combination of textured molding paste and some coarse pumice paste directly onto the cardstock. The angel wings would be embedded into the pastes along with a few random embellishments like buttons, metal keys, etc. Once this dried I would paint it all with some Liquitex metallic ink paints. This would all be done on a small area in the bottom left leaving the rest of the cardstock empty, thus creating white space. Sounds easy hey……..? Not so, I discovered the hard way. I got off to a good start with my picture placement against the black cardstock which I knew would be a great contrast against the metallic paints I planned on using. I prepared myself for applying the pastes by placing a tablespoon full of both the Golden light molding paste and the heavy coarse pumice paste onto my non-stick craft mat. Using a trowel, I applied some of the light molding paste around the two sides and top of the photo and some heavy coarse pumice paste around the bottom of the photo. I then used my finger to spread the molding paste creating dips and peaks as I went. (Insert image of me screaming and banging my head against the wall here). This was where things started going horribly wrong. After I embedded the angel wings and a few other random embellishments I added more paste and spread it a little more and then some more until I was left with what looks like a mud puddle gone wrong. This was definitely not the idea I had in mind. At this point I was ready to trash the project because there was no way I could work with what I had. At least that is what I thought until I took a breather and then decided to salvage this project. I don’t have pictures for the next few steps because I wasn’t sure if I could make this work and was too focussed on what I was doing to stop and take pictures. I decided to remove the angel wings (easily done because the molding paste is slow drying) and cut a portion of the project out. I left a 1.5” frame around the picture with the paste on. I painted the angel wings with some gold and bronze Liquitex metallic ink paints and re-embedded them into the paste. I added some extra molding and paste and used my finger to create more prominent dips and peaks in the paste. I covered the bottom of the framed area with some more heavy coarse pumice and embedded a button and metal key into it. I put it one side to dry overnight. Once the paste was completely dry I painted it with a combination of gold, silver and bronze Liquitex ink paint. This is a stunning combination and I was delighted with the result. At this point I started feeling a lot more optimistic about my project again. Maybe I was going to be able to salvage this disaster after all. Look at the stunning effect of the metallic paints on the coarse pumice. I realised the gold and bronze was very over-powering so decided to add some black tar gel to break it up a bit. I used some masking tape to cover my photo and the angel wings to protect them from the tar gel. On my non-stick craft mat I mixed equal portions of Golden tar gel and Golden soft gel medium together with some black Liquitex ink paint. The soft gel medium helps restore the body of the tar gel that the ink paint compromises. Using a trowel, I scooped up some of the coloured tar gel and slowly moved it back and forth over my frame. The tar gel has a stringy consistency so it will fall onto your project in thin threads. I put this one side to dry with the masking tape still in place. Once the tar gel had completely dried I removed the masking tape and was blown away by the result. In my original design I had not planned on using this technique, so things were definitely looking up. I painted the edges of a piece of black cardstock with the same combination of gold, silver and bronze I used on the paste to use as my layout base. With a second piece of black cardstock I used the water distressing technique to distress all four sides. I then painted the raised creases with some random strokes of gold paint. I then layered this on top of my base cardstock with the painted edges. I have to take a moment here to show you a close-up of the black tar gel on the gold paste. Don’t you just love the effect. This is definitely a technique I will use again in the future. I painted some white Prima flowers and added a vintage brad by Creative Charms. I used some copper and gold Ranger alcohol ink mixatives to alter this metal angel charm I had in my stash which I hung from some metal chain I bought at a discount craft store by the yard. Using my melting pot, I melted some bronze and platinum UTEE together and poured it into this metal plaque. Once it had dried I added some title stickers. I also painted a piece of cream lace I had with the metallic paints and added that to the top right of my layout with the bronze plaque underneath it. I had some large daisy bloom in my stash that were printed with these really gaudy patterns so I painted those with some metallic paints too, transforming them from gaudy to gorgeous. I used another Creative Charms brad as a flower centre. I stepped back and looked at what I had created. Even though it looked nothing like the original idea I had in mind, I was rather pleased with the result. This entire experience taught me that when things aren’t quite going as you planned, rather than give into your frustration and give up, dig deep and persevere. You may not end up with what you planned but you could learn a few new things along the way. I would never have thought to add the tar gel to my project until I was faced with this dilemma and now I’ve discovered a new technique I absolutely love. I know that many of you will be able to relate to this experience and I hope that I have in some small way inspired you to dig a little deeper the next time you are faced with a situation like this. Don’t give up, just re-invent your original idea. You’ll never know unless you try. wow that is just bautiful, love all the details and techniques you used. Do you want a chance to be published? ?